Board Ken Cardwell - Jericho Road, Inc.
Ken Cardwell grew up in southern Oregon, enjoying the outdoors. That love of nature continues here in Central Oregon. Graduating from college in Ashland with a degree in mathematics, Ken worked for a year before returning for his teacher’s degree. Starting in 1972 he taught math and computers for the next 21 years. 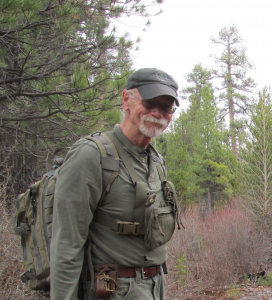 Now retired, Ken’s hobbies have been as varied as his curiosity: Clown, certified national road bike mechanic, fly fishing, teaching survival skills, competitive hawk and knife throwing and blacksmithing! Ken and his wife Diane, also a retired teacher, have two children and two grandchildren. The Cardwells dedicated volunteers, helping Jericho Roads programs. Ken also volunteers as a camp visitor to the homeless around the Redmond area delivering much needed water, fuel and other essentials.